Arc'teryx's armour-compatible clothing is designed to work as part of a synergistic system that integrates body armour within the layering system. By creating a series of products that are designed to work in conjunction with your gear, we are able to increase comfort, performance and versatility across a wide range of activities and environments. Our new Armour Compatible Halfshells utilize hybrid textile combinations to facilitate increased comfort and mobility. Breathable, stretch fabrics (3) are used in areas that are covered by body armour (torso), and durable, waterproof or windproof fabrics are used in high-exposure areas (shoulders, sleeves, hood). 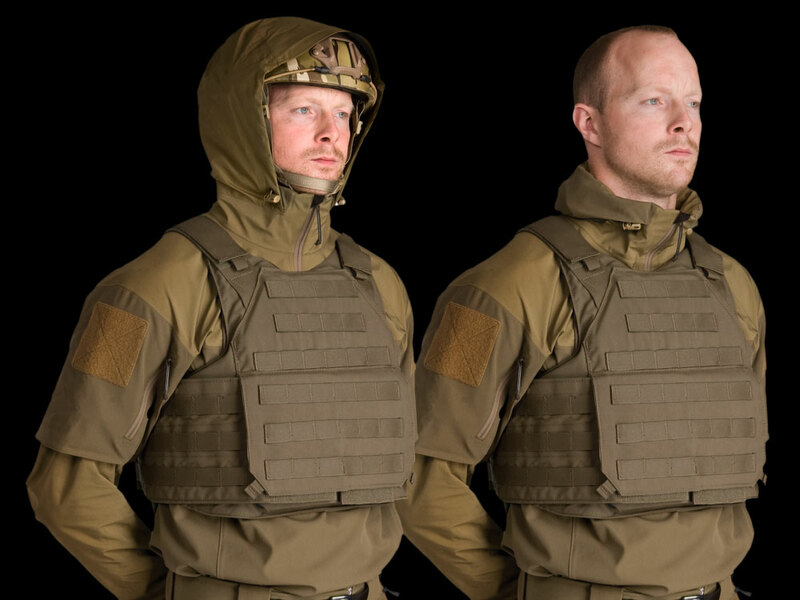 Our Roll-and-Stow sleeve system (2) enables the wearer to modify the sleeve configuration from long to short during high-output activity, and the Stow hood (1) can be rolled-up and tucked away quickly and easily, both systems functioning effortlessly whilst critical body armour stays in place. LEAF products are designed to work in conjunction with one another and your field gear. Hybrid, under-armour halfshells are designed with longer torsos that can be tucked into pants, and low profile hems, flatlocked seams and soft, breathable fabrics create a more comfortable user experience by increasing breathability under armour, eliminating bulk in vulnerable chafe areas, and reducing pressure points under thigh rigs or backpack hipbelts. Knee caps (4) with integrated 'through-access' strap configurations and easily adjustable buckles—combined with reinforced external webbing panels—fit into specially-designed knee cap pockets in our Sphinx and Gryphon pants keeping the knee cap in place close to the knee. 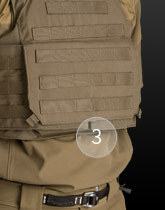 Collar zippers stop short of chest armour, and pockets are placed strategically to increase accessibility while kitted up. Pants with integrated scree cuffs (5) interface with boots to seal against dirt and debris. Every design detail has been chosen to enhance the performance properties of each layer within the integrated system, resulting in the highest-performing and most comfortable combat-ready outerwear available. Our new Armour Compatible Halfshells utilize hybrid textile combinations to facilitate increased comfort and mobility. Breathable, stretch fabrics are used in areas that are covered by body armour (torso), and durable, waterproof or windproof fabrics are used in high-exposure areas (shoulders, sleeves, hood). Integrated Stow Hood fits over a helmet, and can easily be rolled up and tucked away without first having to remove the jacket or armour. Roll-and-Stow sleeves roll up and stow easily to create a short sleeve jacket, as temperatures rise, or output increases, without having to remove body armour. Our Tango pack is built upon our revered Bora suspension design - a sturdy, dual aluminum stay system positioned in a V-alignment. This configuration is the key to our pivoting hipbelt design, which improves load stability and allows natural hip rotation on technical terrain, conserving critical energy. The Echo pack utilizes a stripped down version of our V-Frame™ suspension system. This lighter system maintains all the carrying power of the Bora suspension, but features a slimmer profile shoulder strap and pivoting hipbelt to reduce bulk. The back panel consists of an ultra-thin laminated foam layer that gets the load close to the back while the stiff plastic insert maintains the shape and rigidity. 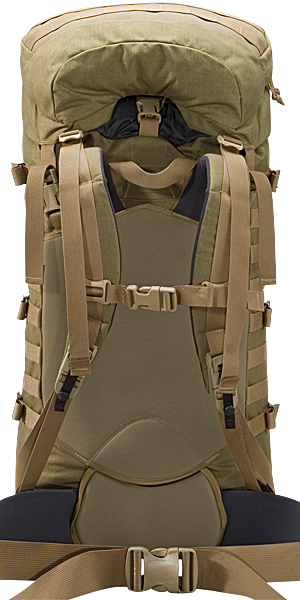 The Tango and Echo packs feature back panels, hipbelts and shoulder straps made with our revolutionary Vapor™ thermoformed technology. Constructed of layers of variable density foam, they are laminated and thermoformed into a curved and cupped shape that conforms to the anatomical contours of the wearer. This thermoformed shape removes pressure from the hips and shoulders, transferring the load gently over the entire area of contact. This proven suspension construction method increases comfort and the ability to carry heavy loads for longer periods. Signal Reduction: The best components are selected to minimize audio and visual signatures, while increasing tactile recognition.